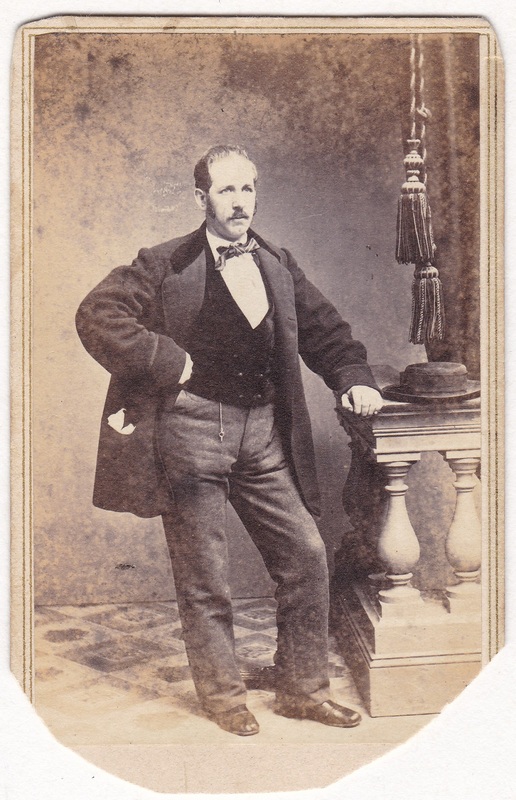 Carte de Visite (CDV), trimmed down to about 2.5 x 3.75 inches. Photographer is William Shew of San Francisco. No date or other identification. As always, I find it fascinating to consider a photo taken a long time ago in a place I know well, in this case in a photo studio at 423 Montgomery Street in San Francisco. Since it’s about a block from where I work, I walk by that location all the time, though the building no longer exists. I also like the confident attitude this guy is displaying. It’s impressive that he’s managed to hold this pose, even though the exposure time was apparently long enough that he required a posing stand, the base of which you can just see between his feet. Also, I wonder what the fob is that’s hanging from his waistline. By the way, I previously posted a picture from this photographer here. I wonder if the tie is that way because he was sloppy, or if it was the fashion. I’m also interested in his almost-porkpie hat and handkerchief visibly stuffed in non-breast pocket, and those big sleeves–these details always seem surprising from 2017, when people tend to think of 19th century fashions as much fussier than ours. I know what you mean. I like the hat, but I thought it was a bit unusual for the overall ensemble. I wondered about the tie, too. It’s the sort of look, with nice elements assembled in a slightly off way, that a modern movie might use to denote a man of ill repute. Or maybe he’s just a guy who came out to the Wild West to make his fortune, and isn’t used to dressing up, but is sending this photo back home to try to prove he is doing well.